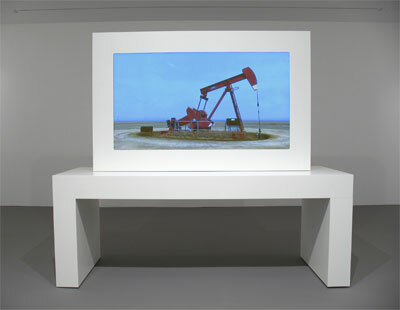 Image: John Gerrard, Sentry (Kit Carson, Colorado), 2008 (Realtime 3-D on plasma screen, Sculptural display: 78 x 87 x 31 1/2 inches overall with table, Edition 6) Courtesy Knoedler Project Space and the artist. John Gerrard creates eerie landscape works in realtime 3D (a type of graphics usually used in gaming), seen recently at the Knoedler Project Space and Simon Preston Gallery. Eerie because their encircling viewpoints, afforded by slow moving, 360-degree camera pans, not only posit them between the cracks of photography, sculpture, cinema, and painting but also carry a whiff of surveillance. They operate in real time, showing their subjects both in daylight and moonlight, amid enormous, man-made constructions in remote country settings, thus imbuing 20th century industrial inventions with the ancient mystery of the pyramids or Stonehenge. 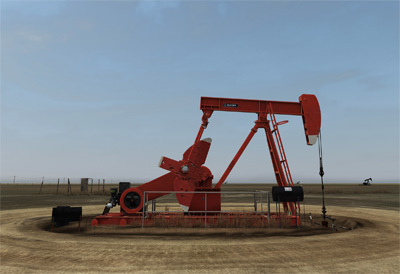 In 2008's Sentry (Kit Carson, Colorado) at Knoedler, Gerrard presents a red oil derrick continuously pumping oil. There are no people in sight, only telephone wires and a few silos barely visible in the background. It's a reflexive work, a virtual mechanism designed to run on its own in real time without human supervision (as is the derrick). The up and down movement of the pump provides a counterpoint to the lateral movement of the camera, while the camera's perpetual motion mirrors the derrick’s constant activity. Alan Licht is a writer and an acclaimed musician. His career in music spans over two decades, and he's worked with a veritable who's who of the experimental world. Licht was also curator at the famed New York experimental music venue Tonic from 2000 until its closing in 2007, and has written extensively about the arts for the WIRE, Modern Painters, Art Review, Film Coment, Sight & Sound, Premiere, Purple, Village Voice, New York Sun, Time Out New York, and other publications. His first book, An Emotional Memoir of Martha Quinn, was published by Drag City Press in 2003; a new book, Sound Art: Beyond Music, Between Categories, the first extensive survey of the genre in English, was published by Rizzoli in fall 2007. The sound art exhibition he curated, Insideout, is currently on view at Laboratorio Arte Alameda in Mexico City through May 3rd. I like this idea, not necessarily for just the artistic sides of it. I think it's pretty interesting that Gerrard used real time 3D to create this. I rarely play video games, but my friends are always staring at a screen clicking buttons, which I see as a waste of time and completely pointless. With that in mind, I find it wholly amusing that he has used the same software to create art instead of another mindless way to spend time. The other aspect of this work that I really enjoy is the lack of humanity within the piece. Sure there are some silo's in the background, but blatant evidence of human activity; trash, cars, footprints, anything obvious like that cannot be found within the imagery. Obviously the oil derrick was created and installed by humans, but without any other evidence it shows how inhuman human creations can be.